Get the Best Price on Groceries! When it comes to getting the best price, consumers have never had it better. Technology has enabled so many comparison sites, applications and the like that the consumer can always find a better price. In the UK, grocery shopping has escalated to an unprecedented level of price comparison shopping. 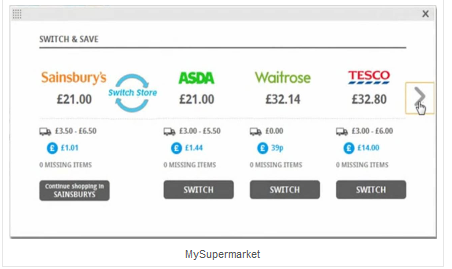 mySupermarket allows you to compare prices across the largest Grocery and Health & Beauty stores in the UK. You’re guaranteed to find the best prices, all the offers and the best value. They offer 3 types of shop: Groceries, Health & Beauty and Wine. All you have to do is select your favorite retailer – Tesco (http://tesco.mysupermarket.co.uk/), Sainsburys (http://sainsburys.mysupermarket.co.uk/), Asda (http://asda.mysupermarket.co.uk/), Waitrose, Ocado, Boots, Superdrug, Virgin Wines or Majestic and start shopping! It’s up to you how you use the site: You can order your basket online, print your basket as a shopping list and take it with you to your local supermarket or simply just compare different supermarket prices online. Unit pricing is available on all products, and once a product is added to the basket the user will be prompted to Swap & Save–two smaller bottles that are on sale for less than a bigger bottle which is typically cheaper, for example. While the shopper initially chooses a retailer, a running tally of their basket at the other major grocers is always visible on the right of the site. If the basket is cheaper at another retailer, it can be transferred with one click. Once shopping is complete, users can checkout at their chosen retailer by putting in their account information. Pricing information and inventory are updated daily according to your local stores. More ways to save your money in our next post. Stay tuned. Previous postWhy I Love Fantasy Baseball!